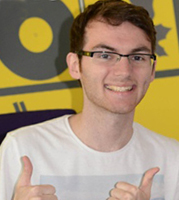 The way we project our limitations onto others is a subject I found was highlighted this month by the story of brave Stephen Sutton. As many know, the cancer sufferer’s post on Facebook to raise £10,000 turned into a heart-warming story before his sad death. In fact, it raised over £4 million… and counting. But when he reported to have unexpectedly ‘coughed up a tumour’ a few weeks ago and was allowed to go home, some public and celebrity comments started suggesting that his entire campaign was a publicity stunt and that he may not have been as ill as they were led to believe in the first place. My feeling is that when we’re presented with something that seems outside of our understanding, something ‘too good to be true’, we have a tendency to project that disbelief onto others, believing their actions to be ‘impossible’ or ‘unbelievable’. But surely that’s only a projection of our own limitations? How humbling it must have been, then, when Stephen did go on to die from his terminal cancer, as predicted. And, more importantly, we now know that all those who protested would probably never in their wildest dreams have done anything as charitable themselves. It’s why I’d rather believe that someone would do something I couldn’t foresee doing myself, and be wrong, rather than project my limitations onto them and see the world be as limited as my own humble beliefs. Long may these extraordinary people show us how limited our beliefs truly all are… they restore our faith in humanity and give us hope for the future. 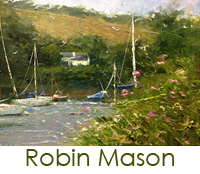 And on the subject of extraordinary people, I was delighted by the turnout for Robin Mason‘s exhibition – the first of this year’s Fisherman’s Shelter Exhibitions here in Portscatho. 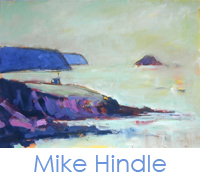 He bought some stunning work (as always), the remainder of which you can see now on his page of our website. 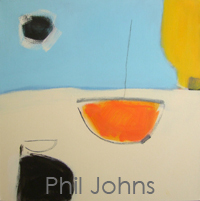 Phil Johns has created a brand new styled– talk about bright and fresh! It’s always exciting when an artists takes a detour from their usually successful style and very brave, but I’m sure Phil’s new works will be just as much a hit. 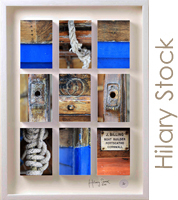 Hilary Stock has been selling well this month. Her Portscatho Boat and Beach Huts are cases in point. She’ll be at the Fisherman’s Shelter from 5th – 7th August if you can make it. Soooo lovely, you’ll just wanna hug her! 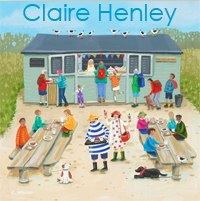 And the youthful Claire Henley’s next on the cards there from 25th – 27th July. 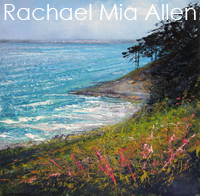 She’ll have some new works with her, but also some of her hugely successful prints of both the Hidden Hut and Treloan. These you can also buy at any time direct from her page on our website. 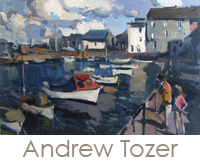 Having Mike Hindle back in the gallery has been wonderful, too, and his paintings have been exceptionally popular over the last six weeks, as have the inimitable Andrew Tozer’s, whose popularity continues to go from strength to strength. He’s in the process of doing a new summer collection for us as I write! Gotta love that! And in the 11th hour, the lovely Rachael Mia Allen pops in with some beautiful newbies and Andrew Allanson has just delivered two amazing new paintings, too! So there it is. I’m itching to let you all know about the exciting new art-based website I’ve just secured £10k’s funding towards. But the investors and I will hold back until it’s ready to launch towards the end of the year. Suffice to say it’ll be a beauty and as soon as I can, I’ll spill the beans! Have a wonderful June, folks and if you want to talk about some contribution buying or staged payment options for you or a loved one to have something wonderful in easy payments, just holler! My odd mind has been pondering the subject of ‘giving’ this month and I wondered if we sometimes mix up the word ‘giving’ with ‘exchanging’? Let me explain.